Hey “Hamilton” Fans: Here’s a Novel about Aaron Burr’s Daughter. Happy Father’s Day, Aaron Burr! – Jenny and Jonathan Got Married! 19 June 2016 / Comments Off on Hey “Hamilton” Fans: Here’s a Novel about Aaron Burr’s Daughter. Happy Father’s Day, Aaron Burr! So I just wanted to let you know that historical fiction about Theodosia Burr exists. Has existed for decades. 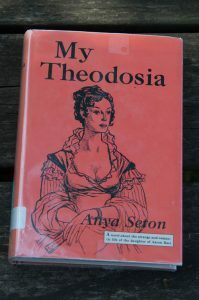 Let me show you My Theodosia by Anya Seton. Yes, it has a copyright date of 1941. Yes, I own a library copy from the 1960’s. 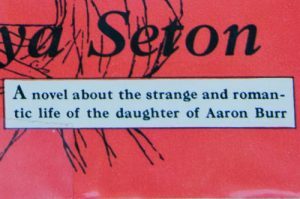 Anya Seton was a well-respected author. My high school library, my college library, and my Grandma Gaffron’s library all carried her books. Phillippa Gregory wrote forwards to several recent editions of several of Seton’s novels. I only purchased and read My Theodosia because of the Hamilton musical. My sisters – especially my 17-year-0ld sister who is involved with musical theater at her high school – love the soundtrack, and they made me a fan. The show includes a song titled “Dear Theodosia” in which Aaron Burr sings to his only child and Alexander Hamilton sings to his first-born Phillip. 1.) I recognized in My Theodosia the exact same characters that I met in Seton’s other novels. I met Seton’s Aaron Burr when he was Nicholas Van Ryn in Dragonwyck and also when he was John of Gaunt in Katherine. I met the slaves at Theodosia Burr Alston’s plantations when they were also the medieval serfs in Katherine. The protagonist is the wife of a slave owner. Therefore, the point of view, the language, everything is through the eyes of said slave mistress. That’s the narrator’s whole perspective. I read Gone with the Wind. I get it. The author wrote this in the 1930’s-40’s, and she died in 1990. Is it fair of me to judge her by today’s standards? But – but – but: last week I read on somebody else’s blog post that fans of Hamilton might enjoy this book. I just want to be clear that this book ain’t Hamilton. It’s fitting that I mention the book today – Father’s Day – because the main plot is mostly about Theodosia’s unwavering love for her daddy, Aaron Burr. Theodosia puts the needs of Aaron Burr above those of every other man in her life. Above her husband. Above her only child, who was also named Aaron. Above Meriwether Lewis, with whom she allegedly had an emotional or physical affair. the southwest at the expense of Mexico. From what I understand, a portion of today’s New Kensington neighborhood of Parnassus actually belonged to the Logan family farm. So maybe Aaron Burr slept here once.